At Mobile World Congress 2014 (MWC14) this year, Samsung had announced its fifth Galaxy S Series smartphone called Samsung Galaxy S5 Smartphone, that it’s now officially release and available from April 11, 2014 in more than 150 countries all over the world. So today in this post we are going to share detailed Review of Samsung Galaxy S5 Smartphone Specifications, Features, Price and Availability details for our readers. Samsung Galaxy S5 Smartphone is powered by many impressive features and specifications which includes; Display Screen of 5.1-inch with full HD Super AMOLED feature, Snapdragon SoC with quad-core 2.5GHz processor and 2GB RAM, storage memory of 16/32GB + micro-SD slot, 16-megapixel camera with advanced AF Rear Camera, 2.1-megapixel Front camera, 2,800mAh Battery Life, Android 4.4 Kitkat Mobile OS, Wi-Fi 802.11ac MIMO and 8-band LTE Connectivity, 142.0 x 72.5 x 8.1mm Dimensions with 145g Weight. Additionally, if we compare Samsung Galaxy S4 features with Samsung Galaxy S5 features so we would find an amazing new features which includes; Upto 12 hours of web browsing and 10 hours of HD video playback, Merges LTE and Wi-Fi-MIMO for ultra-fast download speeds upto 650 Mbps, Real-time HDR in camera and 4K video recording, Makes everything black and white and turns off data. Provides stand-by of upto 24 hours even when 10% battery is left, New 16 MP, super-fast Auto-focus camera that uses selective AF in 0.3 second, World's first heart-rate sensor on a smartphone, Finger-print scanner on the Home button. It also has Security integration with Knox, hiding media and making finger-print as universal password for mobile payments, Water-resistant and dust-resistant. IP67 certified to be submerged in 3 feet of water for up to 30 minutes. 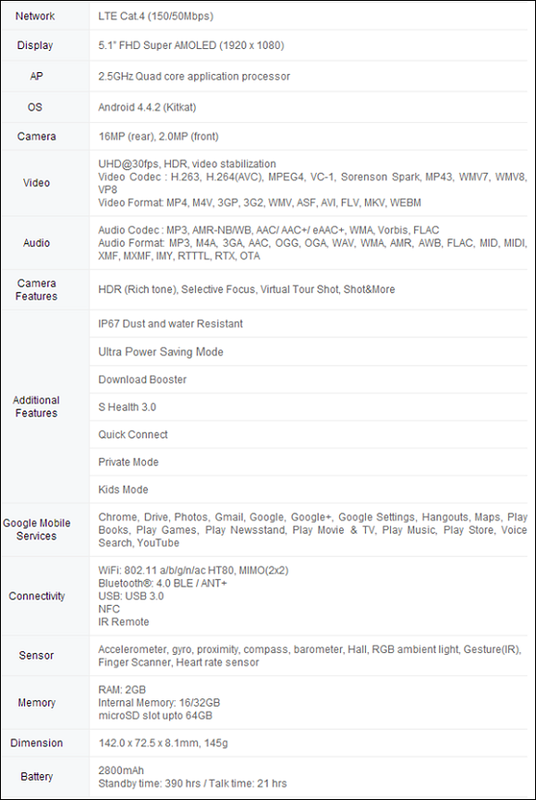 You can read full Samsung Galaxy S5 Smartphone specs and features details in below Infographics. Samsung Galaxy S5 Smartphone is now officially available in 150+ countries i.e. USA, UK, Canada, Australia, Europe, Asia, India, Middle East etc. in five different color models such as "Pure White" "Electric Blue", "Charcoal Black" and "Copper Gold". 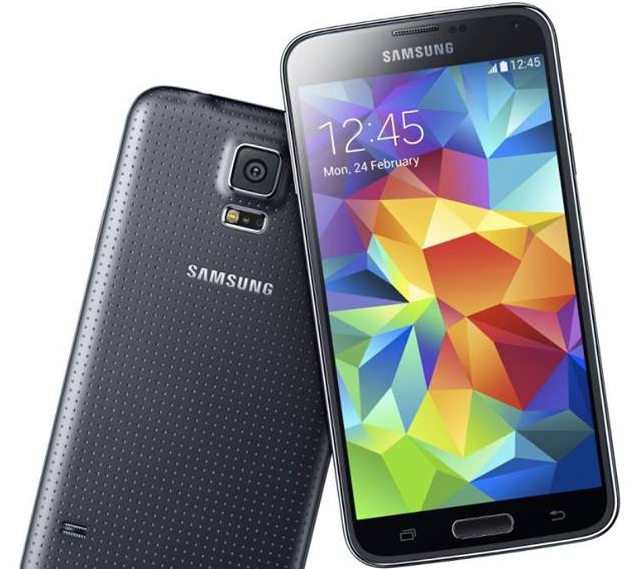 The official price of SIM-free or Contract-free Samsung Galaxy S5 Smartphone is approx. £600 EUR for UK, European countries and approx. $650 US Dollars for USA and approx. $900 AUS Dollars for Australia. You can watch official detailed hands-on, unboxing Video Review of Samsung Galaxy S5 Smartphone before you are going to buy it.